One hour and 56 minutes. That’s how long it took three people to count the 6,908 pairs of underwear that Campbell County residents donated to our Drop Your Drawers campaign. Over the last few months, patrons like you donated $106 to the Friends of CCPL by using AmazonSmile. When you use Amazon Smile, the Friends of Campbell County Public Library will receive a .5% donation on every qualifying purchase. It won’t cost you any more than regular Amazon prices. Getting started is so easy… just go to http://smile.amazon.com/ch/45-5221189 and start shopping. Then each time you shop on Amazon, use smile.amazon.com. Thank you note from Barbara Martin. 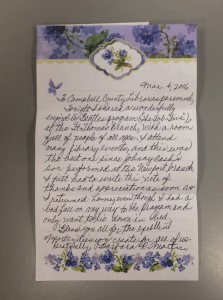 A Carrico patron sent us a lovely thank you note after attending our first Arts & Culture event of the season. Barbara Martin was one of 260 music fans who enjoyed a free concert from Cincinnati Chamber Orchestra’s Beatles tribute, The Fab Five, on Friday, March 4. Thank you for your lovely note, Barbara. There are two more chances to enjoy Arts & Culture Series events at our Carrico Branch. Enjoy a 1940s radio show as Falcon Takes Flight, a division of Falcon Theatre, transports you to the Golden Age of Radio in a fond tribute to the sounds of the Greatest Generation. The Swing Revival of the 1990s fused old jazz and swing with modern rock, a sound the Kentucky Symphony Orchestra recreates with its newest 10-piece show band: The Covington Devou-Doo Daddies.